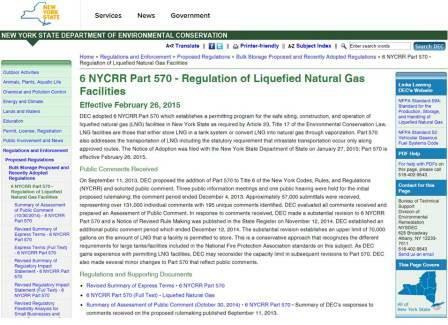 Effective February 26, 2015, the New York State Department of Environmental Conservation (DEC) will begin permitting for the safe siting, construction, and operation of liquefied natural gas (LNG) facilities in New York State. LNG facilities are those that either store LNG in a tank system or convert LNG into natural gas through vaporization. Partly in response to the tragic 1973 Staten Island LNG explosion that killed 40 workers, the New York State Legislature enacted a statewide moratorium on the siting of new LNG facilities in 1978. The full details of the new regulations can be found on the DEC website.